0 of 50 claimed from the final batch 2. 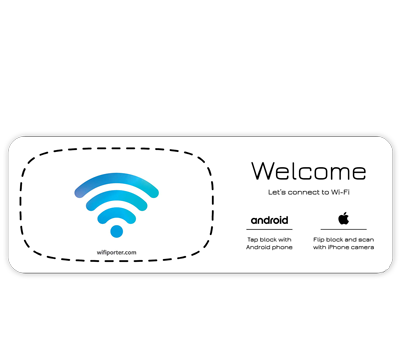 We’ve created a card with Wifi Porter instructions for when the host is not available. Would you like instructions included with your shipment? Older iPhones connect by pointing the camera toward the QR code on the bottom. iPhones join in a flash. Simply open the camera and point it anywhere near the QR code. We’ve teamed up with the talented artisans at Distil Union to create a limited-edition Wifi Porter. It sports an Italian leather surface, exclusive T1/DU laser markings, and is hand-assembled here in Montclair. Limited quantity available. So many devices work with Wifi Porter out of the box. 😂😂😂 Good luck typing that! Everyone hates long passwords, but you’d hate them a lot less if you never had to type them. 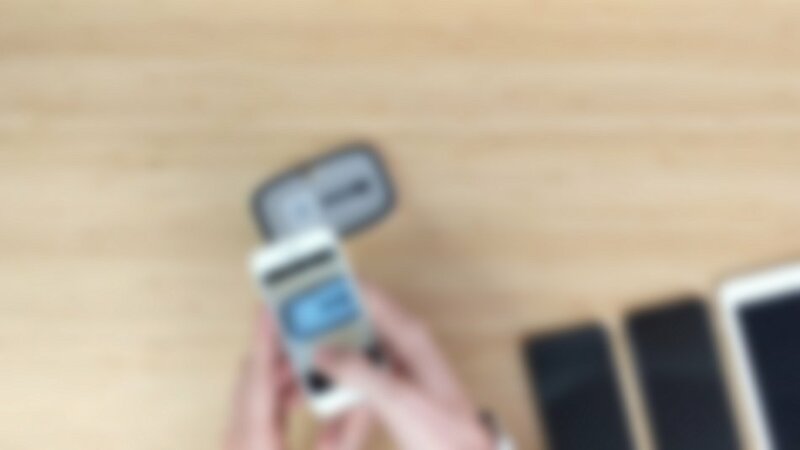 Wifi Porter simplifies it all to a simple tap or camera scan. Everyone hates long passwords, but you’d hate them a lot less if you never had to type them. 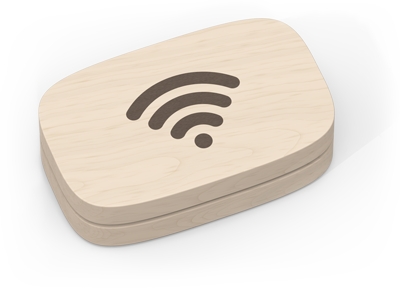 Wifi Porter simplifies it all to a simple tap or camera scan. Meetings start quickly when everyone is on the same network. Spend less time spelling out passwords and more time getting down to business. Meetings start quickly when everyone is on the same network. Spend less time spelling out passwords and more time getting down to business. Instructions make it easy for your guests. Pick a style, and we’ll include them with your shipment. We’ve adopted a new eco-packaging concept for Wifi Porter to reduce its environmental impact. Inspired by big-city warehouse apartments: utility on the outside, luxury on the inside. Game night, book club, play date, AirBnB, babysitter, or out of town guests - no matter the occasion, Wifi Porter makes getting online a great experience. Would you like to see a version of Wifi Porter optimized for commercial spaces? We’d love to chat more. Leave us your info and we’ll be in touch! Android phones with NFC running Lollipop or later. iPhones running iOS 11 or later. Please note setup is limited to the QR code (no One-Tap Wifi) until at least iOS 13 later this year. Does Wifi Porter require any special apps? A free app is used once to configure your Wifi Porter device. No other apps are required. 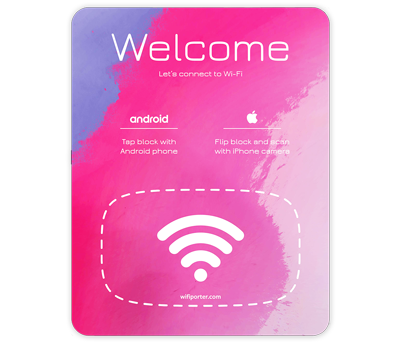 Phones that subsequently tap the Wifi Porter device or scan the QR code will receive the network information automatically and do not require any installed apps. Where can I find the setup apps for Wifi Porter? Can I use Wifi Porter if my network has a password? Yes. All network configuration information is stored in the Wifi Porter device memory. On a side note, once you have a Porter, we heartily recommend using a long, complicated password on your Wi-Fi network. How does using a Wifi Porter affect security? Wifi Porter can be very good for your network’s security. It reduces the drawbacks of long, secure passwords, so connecting is always painless. You should treat Wifi Porter with care as it does store your Wi-Fi password. For example, if you don’t like your cousin Ralph and you don’t want Ralph on your network, keep your Wifi Porter away from Ralph. See the Wifi Porter security details for more info. When will iOS support setting up One-Tap Wifi? The hardware in iOS supports setup, but is limited by the software. It’s a good bet that iOS 13 will allow iPhones to configure One-Tap Wifi. How is the QR code configured for my network? The Android and iOS apps create the QR code for you and can print it out with instructions to install it into your Porter. Installation is quick and painless. What happens when I change my Wi-Fi password? It’s easy to update your Porter using same app you configured it with. Exactly which phones can connect using One-Tap Wifi? Most Android phones running Lollipop (5.0) or later can tap to connect. NFC should be enabled. iPhones from 2018 (XS, XS Max, and XR) can also tap to connect if the Wifi Porter is configured to allow it. Exactly which phones can use the QR code? Any iPhone running iOS 11 or later can connect using the QR code method. An increasing number of Android phones (starting with Google Pixel models) can do the same. Most barcode scanning apps also work as a fallback. I have an iOS phone, and I’d like to also configure One-Tap Wifi. What should I do? You can already configure Wifi Porter for other iPhones using the free app. Here’s an idea how to configure One-Tap Wifi as well: You know that friend who is really proud of their Android phone? Invite them over. Let 'em feel good about themselves for a few minutes. We’ve just updated the Android app so it’s easy to set up a friend’s network. You don’t even need to be in range of the network. What are the mounting options for Wifi Porter? 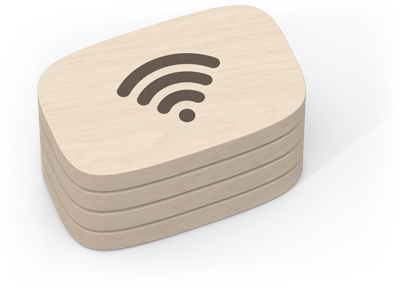 Wifi Porter can be used as a table-top item or wall mounted. The aperture for wall mounting is 17mm (w) x 8mm (h) x 10mm (depth). Can I customize the look of my Wifi Porter? Sure! 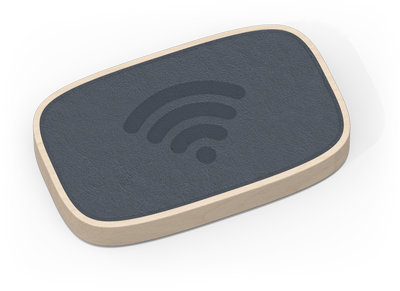 Wifi Porter includes 6 decor-inspired graphic inserts. We think you’ll love at least one of them. What is Wifi Porter made of? 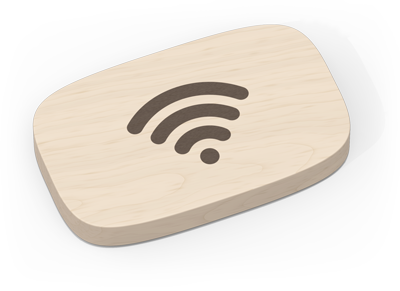 Wifi Porter is carved from a block of hard maple. Each piece is unique. Exact color and grain will vary. Does Wifi Porter require batteries? 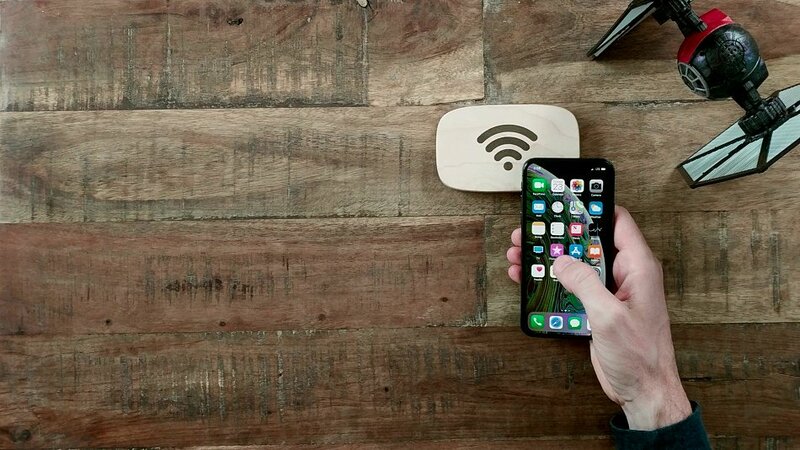 Wifi Porter contains circuitry that is powered by your smartphone when you tap. It requires no batteries or power connection. Does Wifi Porter work with laptops? For most laptops, the Wi-Fi password may be typed in as displayed on the bottom of Wifi Porter. If you’re using an iPhone and a MacBook, a cool trick is to first scan the QR code with your iPhone. When you attempt a connection from your MacBook, your phone will give you the option to share the password with your laptop.